Some animal-behaviour scientists doubt whether dogs can really feel grief when a human parent dies. Experts claim that dogs function on the same intellectual and emotional level as children of four to five years old. They do not understand the finality of death and therefore they expect the deceased person to come back. And yet, from the behaviour of dogs it is clear that they experience loss when a human parent dies. The intensity with which dogs experience loss and the extent to which they grieve, depend a lot on how close the relationship between the deceased person and his dog-child was. is excessively excited when its human parent comes home. Hyperalert around the time when its human parent usually came home. 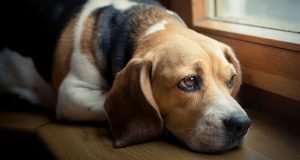 How can you help your dog through the grieving process? · Maintain its normal routine as far as possible, such as times for eating, walking and playing. · Make sure that it eats and drinks, even if you have to feed it its favourite food. · Do not leave it alone, especially at night. Let it sleep in the same room as one of the other family members or with the other pets. · Keep it occupied by day with things that divert its attention ─ play with it, spoil it with its favourite snacks, or a new toy. · Take it for a walk ─ physical exercise has a calming effect and increases its serotonin levels, which will improve its mood. Encourage contact with other people and dogs (social facilitation). Be patient. It is normal for a dog to grieve for a few weeks and even a few months. It is important, however, that it should eventually behave normally. Your own grief and depression while you’re trying to console it, could prolong its grieving process. Medication (prescribed by a veterinarian) could be used as a last resort in extreme cases (if it does not show any improvement after about three months).